and that takes time,time you might not want to invest, so technology give you an option that will allow you to get good info far faster, and reading plugs certainly is not able to give the exact info that a a/f ratio gauge and an o2 sensor can give you, if you want to learn a good deal faster and get more exact answers the use of a fuel/air meter can certainly be a huge help, that doesn,t suggest you can ignore reading plugs, but it sure is a recommendation to get a f/a meter and learn how to use it. 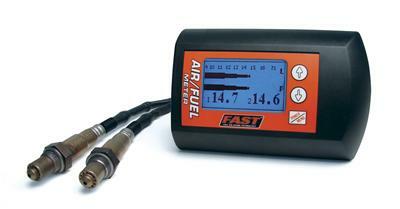 If you do a little research you will find lots of â€œAir/Fuel Metersâ€ on the market priced in the $100 to $ 400 range. These are â€œnarrow bandâ€ products based on production car Oxygen or Lambda sensors. You will also find products priced at $ 1000 to $ 4000 per channel and even higher. These are wide band products. * Shows Actual Air/Fuel ratio. * Precise display of ratio on the rich side of â€œstoichiometricâ€, which is where all performance engines run. Usually displays Air /Fuel ratio to the second decimal place. * Useful for maximizing power from race and other performance engines. * Shows indication of rich vs lean. * Usually has very â€œcoarseâ€ display of ratio on the rich side of â€œstoichiometric. Some units only have 2 LEDs for the entire rich range! * Really only useful for making sure your engine is not running on the lean side. * Usually not temperature compensated, so the same air/fuel condition in the motor will result in an indication on the meter that will vary depending on sensor temperature. 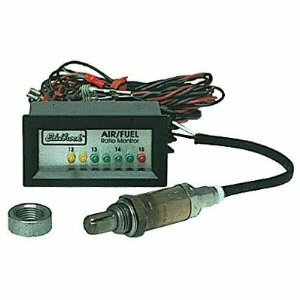 If you are a builder or tuner of performance engines who needs to maximize performance of the engines you work with, then you need to be measuring Air/Fuel ratio with a wide band meter. An air fuel ratio meter is a type of gauge that is used in cars, boats or any vehicle that has an internal combustion engine. Its job is to detect how much voltage is emitted by the engineâ€™s oxygen sensor, and in so doing, it can gauge the engineâ€™s air-fuel ratio. Air fuel ratio meters are important because they help to ensure that your vehicle is using fuel efficiently, helps your catalytic converter to work optimally and thus cuts down on toxic emissions, and maximizes the engineâ€™s performance in general. Nowadays, there are 2 types of air fuel ratio meters on the market: narrow-band readers, and wide-band readers. Keep reading to find out how the two are different, and their pros and cons. The narrow band meter has long been the standard in cars, although now itâ€™s becoming a bit antiquated. They are present in your car in a round-shaped housing. Like the other gauges in your car, the mounting usually measures in either 2 1/16 inch diameter or 2 5/8 inch diameter, with 10 to 20 LEDs. Some are available with a needle-style gauge interface. The reliability of the narrow band meter can be negatively affected by increasing gas temperatures, so they have to be used with care. Wide band meters are newer and more accurate. They can either stand alone or be mounted in round housings also. Unlike the narrow band meters, these have a numeric display, and can display much more sensitive and accurate information. They have a linear output of 0 to 5 V and can function no matter what the temperature of your carâ€™s engine. Narrow Band vs. Wide Band Air Fuel Ratio Meters: Which One Should I Use? If you have an older car that you just need to check on from time to time, especially if you suspect that something might be wrong with the oxygen sensor, then a plain old narrow band reader will probably do just fine. These models are cheaper, and as long as youâ€™re not worried about getting a very sensitive reading, then the narrow band should do just fine. On the other hand, if itâ€™s your treasured sports car that weâ€™re talking about, or if you need to perform some really sensitive, highly refined maintenance, then you should really spring for the wide band meter. The wide band meter gives you more accurate information, gives you more precise numbers, is reliable no matter the temperature and is easier to read. If you feel that thereâ€™s a lot at stake for the health of your car, then, itâ€™s worth the extra investment in a wide band air fuel ratio meter.